As marketers, there’s nothing more heart aching than first seeing a big inflow of visitors on your ecommerce website - spending notable time, adding something in their cart and then abandoning it before undergoing the selling process. So, what does that mean? Do they cut off from your brand forever? Perhaps not! All you need to do is make the extra effort to woo them back and let them know that they are important. Cart Abandonment Emails - The mystic mantra, can do wonders and help you win them back. According to one of the recent surveys, almost 50% of all cart abandonment emails are opened, and abandoners intend to return to the cart. Before you take your front foot forward to woo your abandoners, it is crucial to first understand the psychology of a buyer to know what instigated them to abandon the cart. A recent survey states that more than 10% of cart abandonment emails opened, are clicked. Also, the average order value of purchases through cart abandonment emails is 15% higher than usual purchases. The best thing about online shopping is that a shopper can shop anytime, and anywhere. However, at times shoppers get distracted with other work; and might not only forget about the product they had put in the cart, but your website too. This is when cart abandonment emails work perfectly to bring back the cart abandoners. According to a research by CMO.com, emails comprising product recommendations increases the conversion rate by 2% to 5%. 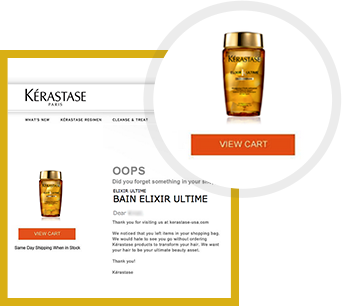 Add multiple types of product recommendation in cart abandonment emails like Product or service similar to what is left in the cart or items purchased with the product in the cart. Shoppers hop on to multiple websites in search of getting a good deal while they shop online. But they might ditch your website at the last moment to try his/her luck with some other discount. This is when triggered emails with some incentives can come handy to bring back your customers. As compared to banner ads, emails have 30% more CTR. This means re-targeting ads are less effective as compared to cart abandonment emails. Try to capture the email addresses at the first step of the funnel, so if the buyer drops out from your website, you can target them through cart abandonment emails. Sending first cart abandonment email within 60 minutes after the cart is abandoned fetches more conversion. There could be multiple reasons to it. Firstly, the shopper might still be online, browsing for other options. Furthermore, as the shopper had recently abandoned the cart, the shopping experience on your website will be fresh. In case there is any doubt in the shoppers mind regarding the purchase such as shipping cost, delivery timelines and so on; your emails might resolve those issues. Sending second cart abandonment email after 24 hours gives you a fairly good chance to win back the abandoners. Considering that online shopping consumes a good amount of shopper’s time, the shopper possibly will shop at (around) the same time - when he/she is not busy with work. This can be learnt by tracking the shopper’s site usage pattern. Thereby, sending an email at the same time after 24 hours might reap you benefits. The third and the final email could be between 3-5 days. After sending the second email, the chances of conversion reduces relatively. Thus, you can decide when to send the third email based on your preference. Make sure you send your emails within a week after the shopper has abandoned the cart. Research has shown that free shipping is as efficacious as percent off; this makes it all the more important to make the cart abandonment emails more tempting by offering free shipping. But if you have a certain criteria for shipping items for free then offer it with a clause. For example, you can offer: Free shipping 5 days a week, add [insert the price here] to your cart and get free shipping. shoppers shop from the websites that offer free shipping. If you are able to capture the email address of your first time buyers, try offering discounts or other perks like free shipping to them. Studies have shown that an abandonment email that contains a discount offer of 5%-10% on the first purchase can help in decreasing the cart abandonment rates. This can be a really beneficial strategy to obtain repeated purchases by up to 20%. 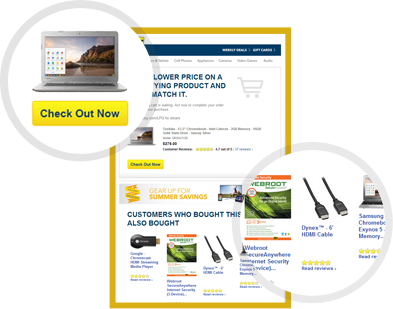 Studies based on eye tracking device reveal that including picture of the abandoned product instead of just the product link in the cart abandonment email fetches more attention than that without. Kérastase does it well by including the image of the product, with a clear & crisp CTA, and impeccable copy. The product image instantly grabs attention and the CTA teleports the buyer to the abandoned cart. 80% of online shoppers find recommended products in email useful. Thus, cross selling the products to abandoners can also turn into an ultimate blessing for your business. Here is a great example from Best Buy. The recommended products have been organized perfectly in the email to have a thorough view to help the shopper in making the buying decision. The reasons for shopping cart abandonment could be many, and one of the most prominent ones being lack of surety. Cart abandonment emails can help resolve the queries of abandoners - providing them ample information and helping them make the buying decision. Give your buyers sufficient options so as to help them reach you and get their queries resolved. Email marketing is not the only strategy that can help in winning the hearts of your subscribers. There are more popular ways to decrease the cart abandonment rate in addition to emails. Retargeting ads are a great way to bring back cart abandoners especially when a buyer’s email address could not be captured. This happens mainly when a shopper abandons the website before filling the personal details. notifications, etc. also works great to bring back cart abandoners. Sending 3 cart abandonment emails is the ideal exercise, of which the first email should be sent within 60 minutes after the cart is abandoned. 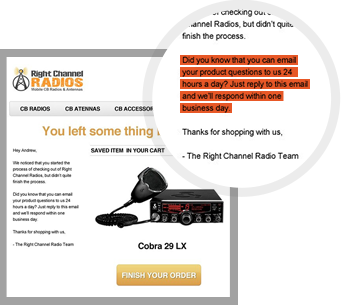 Combine cart abandonment emails with re-targeting, multi-channel strategy, etc. for a higher success ratio. Consider adding the image of the abandoned product to grab the abandoner’s attention instantly. Don’t forget to cross sell; adding product recommendation helps the shopper in making the buying decision. Cart abandonment email best practices: infographic. 50% of the abandoners intend to return to the cart. When is the best time to send cart abandonment emails & recover lost sales. Best practices of cart abandonment - "consider free shipping”. Email Monks design and code heavenly emails, newsletter templates and landing pages.